Located in Northwest England along the shores of the river Mersey, Liverpool is perhaps most famous as the birthplace of the Beatles and draws thousands of music fans each year to its various attractions. Its historic waterfront, recognized as a World Heritage site, is a scenic reminder of its history as a globally important trade port at the height of the British Empire. 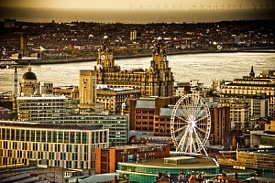 Liverpool is also proud of its diversity and is home to two majestic cathedrals, an impressive 19th century synagogue and the oldest Chinatown in Europe.